The Elections Division of the Office of the County Clerk will be offering drive-thru voter registration services for the General Election in the parking area fronting the Historic County Building and Annex from 8:00 a.m. to 4:00 p.m. on Monday, October 6, 2014. 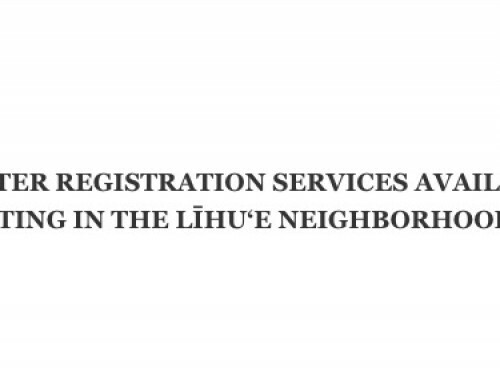 This service coincides with the 2014 General Election voter registration deadline on October 6, 2014. Individuals wishing to use this drive-thru service can drive to the parking area fronting the Historic County Building and provide voter registration officials with current and valid photo identification. Other acceptable forms of identification include a current utility bill, bank statement, government check, paycheck, or other government document that shows the name and address of the individual who is registering to vote. To register to vote, an individual must complete a voter registration affidavit and show the drive-thru staffer an acceptable form of identification noted above. Registered voters who wish to update their registration information or apply for an absentee mail ballot can also utilize this drive-thru service. The General Election will be held on November 4, 2014. For additional information, please contact the Elections Division at 241-4800.